Third revised edition, loaded June 4, 2013. S'rî S'uka said: 'Garga the family priest of the Yadus, a man of great penance, oh King, on the request of Vasudeva went to Nanda's cow community. Nanda very pleased to see him stood up to welcome him with folded hands. Knowing him to be someone elevated above the senses [adhokshaja], he out of respect prostrated to offer his obeisances. With the greatest hospitality and the sweetest words he offered the sage a seat and said, after thus having pleased him: 'Oh brahmin complete in your self-realization, what can I do for you? When great souls [like you] move towards simple-minded householders, one must never think that such a thing would happen for any other reason than their best interest. You are the author of a book concerning the transcendental knowledge of the movement of the luminaries, [an astrology book] from which any one directly may learn about the reason and consequences of his fate. S'rî Garga said: 'Everyone knows that I am the teacher of example of the Yadus. In this world I always perform the purification rite for every son [of that family]. If I perform this ceremony for you, your sons would be considered the sons of Devakî. S'rî S'uka said: 'The man of learning thus urgently requested in secret seclusion performed the name-giving ceremony for the two boys for which he had come. S'rî Garga said: 'He, this son of Rohinî, will with His transcendental qualities be the pleasure of all his folk. Therefore He will be called Râma. Because of His extraordinary strength He will also be known as Bala and because of not existing separately from the Yadus [see also 10.2: 8] He will further be known as Sankarshana [the unifier]. And this one [the son of Yas'odâ] has according to the yuga accepted forms with a white, a red or a yellow color. Now He is Krishna [of a dark complexion, see **]. This child previously was born somewhere else as the son of Vasudeva and therefore the ones who know this will speak about this child of yours as the glorious Vâsudeva. There are many names and forms according to the qualities and activities of His appearances. These are known to me, but the common people do not know them. Being a Nanda-Gokula cowherd this child will always act to what is most beneficial to all of you. With His support you will easily overcome all dangers [*3]. Oh King of Vraja, in the past, when there was a faulty regime, He has protected pious souls who were disturbed by rogues so that they, with those bad elements defeated, could flourish [see also 1.3: 28]. Just like the ones faithful to Vishnu have nothing to fear from the Asuras, those who are as fortunate to associate with this child in love and affection, will not be overcome by enemies. S'rî S'uka said: 'After Garga thus fully had informed them about the Supreme Soul [the way He had manifested in the form of the two boys] and had left for his place, Nanda, being blessed with all good fortune, considered himself most happy. Shortly thereafter Râma and Kes'ava [Krishna] were crawling around in Gokula on their hands and knees enjoying their childhood. Crawling like snakes through the mud of the cow place while dragging their feet behind them, they produced a sweet sound with their ankle bells, but when they, charmed by those sounds, enthusiastically followed [the ankle bells of] other people, they became afraid and quickly returned to their mothers. When their mothers closed their, by the mud charmingly colored, bodies in their arms, they allowed them to drink from the milk which, because of the great love for each of their sons, flowed from their breasts. And when they, while they were sucking, looked into their mouths they were delighted with the greatest ecstasy to discover that their teeth were growing. From within their houses watching the children play outside in Vraja, they laughed and forgot their household being amused to see how the two boys caught the ends of the calves' tails and were dragged around by them. When the mothers during their household duties could not find a way to check Them being engaged in Their tireless play with the cows, with fire, with sharp-toothed animal beaks [of dogs and monkeys], with swords, water, birds and thorns, they were unsettled. Râma and Krishna very soon without the help of their knees oh King, with ease began to walk around on their legs alone in Gokula. The Supreme Lord together with Balarâma playing with the other kids in Vraja then awakened a heavenly bliss in the ladies of Vraja. 'Once He untimely released the calves and smiled about the anger that gave rise to. Some or another way He stole the palatable curd, milk and butter from the pots, ate from it and also gave each monkey a share. When they refuse to eat [having enough], He breaks the pot and when He cannot find any [food to feed the monkeys], He gets angry at the people of the house and goes around pinching the babies. [With the pots] hung out of reach He devises a way by piling up things or turning over a mortar and then finds His way to the contents by making a hole in the hanging pot. Awaiting the time that the gopîs are busy with their household affairs, He with the necessary light from the radiating jewels on His body manages to find His way in a dark room! He is so naughty that He sometimes freely urinates in a clean spot in our houses and that cunning, resourceful thief now sits there like a nice boy!' The gopîs present there discussed all these matters, but when they saw Him sitting in front of them, looking afraid with His beautiful face, the gopîs were happy to see Him. They with their complaints against Him truly could not be angry with Him and having a good time had to smile only. 'Is that so? Then open wide!' she told Him and He, the Supreme Personality, the Lord whose opulences are unlimited, in His pastime of acting like a human child opened His mouth. 'Is this all a dream, a divine phantasmagoria or maybe a delusion of my own intelligence, or would that what I so see differently be some yogic phenomenon natural to my child? Let me therefore surrender at the feet of Him beyond my range of vision whom I may not understand, who escapes my consciousness, mind, action and words and under whose control I live and may return [home, back to Godhead]. After mother Yas'odâ thus had received this understanding of His reality, He, the master of illusion, the mighty Vishnu, manifested for her again the magic of the affection for her son. With the memory [of the vision] instantly faded, the gopî placed her son on her lap with a heart filled with the same intense affection for her son as before. The honorable king said: 'Oh brahmin, what were the pious activities [see B.G. 7: 16] performed by Nanda and Yas'odâ from whose breast the Lord drank His milk? How did they achieve the highest perfection of such a blessing? 'So be it' was the answer [given by Brahmâ]. Drona thereupon took his birth in Vraja and became the Great One [the Bhagavân to Bhagavân], the highly distinguished and celebrated Nanda and she, Dharâ, appeared as Yas'odâ [compare 10.3: 32-45 and see *4]. Oh son of Bharata, for that reason there was from both the parents and all the gopas and gopîs, the constant [love of the] devotional service unto Him who had appeared as their son, the Lord our well-wisher. *: The Sanskrit says here 'by birth', but the paramparâ stresses the second birth or initiation. Svâmî Prabhupâda comments: 'No one is born a brâhmana; everyone is born a s'ûdra. But by the guidance of a brâhmana and by samskâra, one can become dvija, twice-born, and then gradually become a brâhmana. Brâhmanism is not a system meant to create a monopoly for a particular class of men. Everyone should be educated so as to become a brâhmana. At least there must be an opportunity to allow everyone to attain the destination of life.' Next to this second birth there is also the third birth one has from one's sacrificial activities: independence is achieved with the internalization of the guru (see also 4.31: 10, 7.11: 35). **: The word 'krishna' means more than just 'dark'. Svâmî Prabhupâda comments: 'If we analyze the nirukti, or semantic derivation, of the word "Krishna," we find that na signifies that He stops the repetition of birth and death, and krish means sattârtha, or "existence." (Krishna is the whole of existence.) Also, krish means "attraction," and na means ânanda, or "bliss." 'His colors are discussed later on in Canto eleven under: 11.5: 21, 24, 27 en 34. *4: Concerning this difference between the privilege of being the actual parents Vasudeva and Devakî and being His foster parents Nanda and Yas'odâ, Prabhupâda explains that there are two types of siddhas, the perfected ones or liberated souls: nitya siddhas and sâdhana siddhas: those who are eternally liberated like Nanda and Yas'odâ who are eternally Krishna's associates or expansions of Krishna's personal body, and those ordinary human beings who acquire a special position by enduring sâdhana, the spiritual practice of executing pious activities and following the regulative principles of devotional service. The first picture is titled: "Nanda requests a horoscope for Krishna". Page from a Bhagavata Purana series. Made in Rajasthan, India, ca. 1725. Source: Brooklyn Museum. 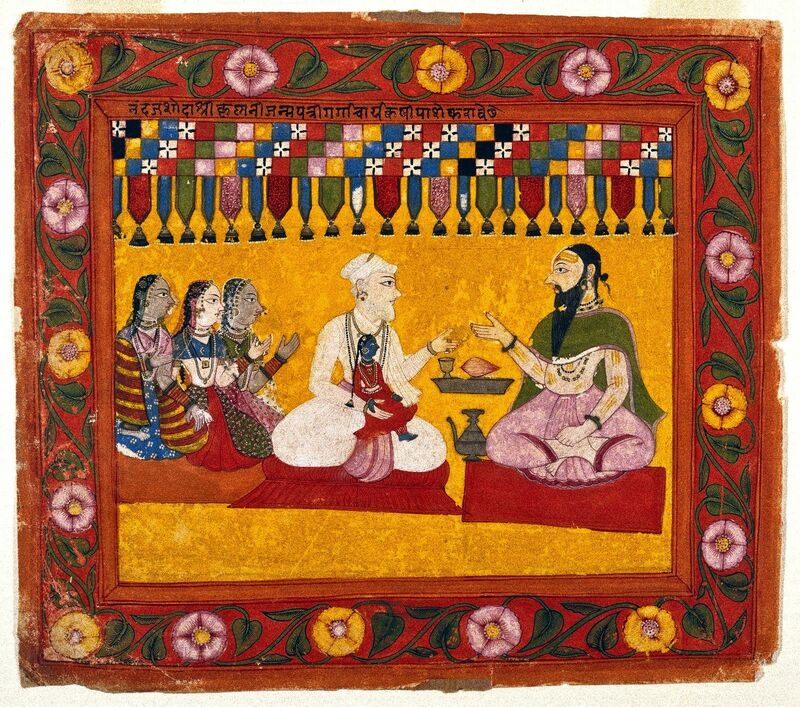 The second picture is a detail of a painting called: "Maharao Shatru Sal I of Kota and Courtiers Celebrate Krishna's Birthday"
Made in Kota, Rajasthan, India, 1764. Source: Philadelphia Museum of Art. The second picture is a Bhagavata Purana folio depicting Krishna stealing butter. Rajastani painting. Source. 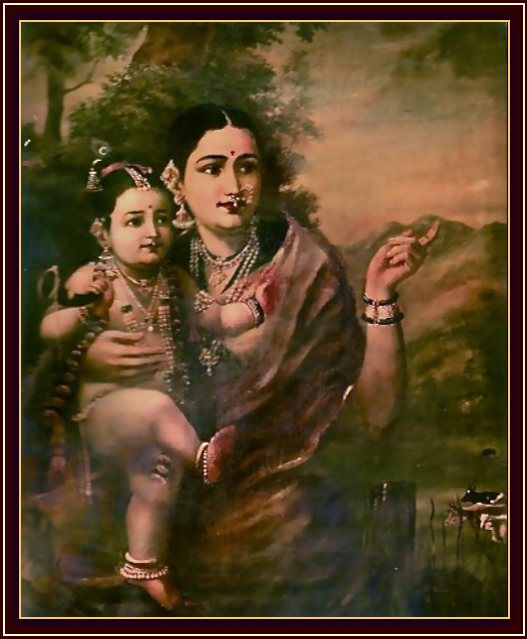 The third picture is a painting by Raja Ravi Varma of Krishna with Yas'odâ.